Knock is a python based tool for enumerating subdomains on a targeted domain. You can use a custom wordlist and also you can scan a domain for DNS zone transfers. It also supports queries to Virus Total subdomains. First things first, you have to install the dependencies manually. After that clone the Github repository to your machine. Then, follow the instructions below. Let’s first see all the available commands. Very simple interface, you just have to type the domain you want to test. If you want, you can use your own custom wordlist. Also, it gives you the option to export your results in json or csv format. In the example we typed ‘python knock.py -r (site)‘ and we got some basic info about the DNS transfer zones and wildcards. It’s very useful to have this info to perform exploitation later. You can also go to THIS address, to add the Virus-Total API in the knock.py script. Let’s now use a custom wordlist to check for sumdomains. Use the command below to test it. The scan may take several minutes to complete. In my example, the host doesn’t has any subdomains. However, in a real host the results will be shown in the table below. Knock is very smooth for subdomain enumeration. However, I think is a bit slow in comparison with other tools I have tested. So, I’m giving it 3 out of 5 bunnies. 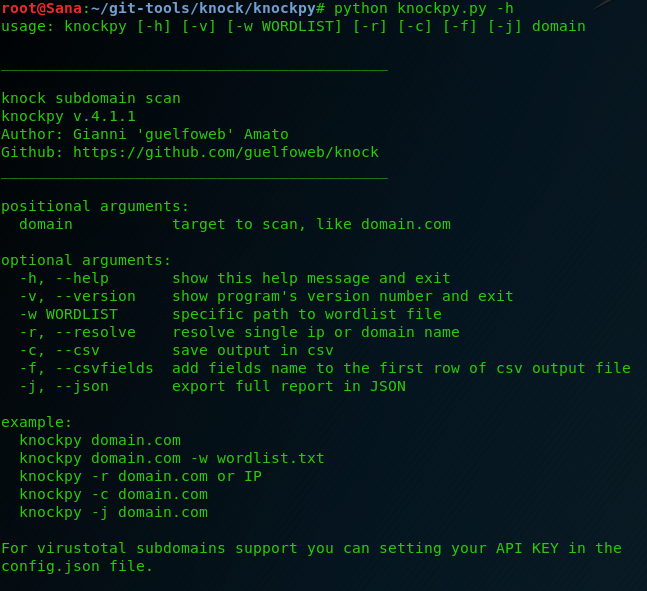 Hey Buddy!, I found this information for you: "Knock – Open Source Subdomain Scanner Tool". Here is the website link: https://hacknews.co/tools/20181130/knock-open-source-subdomain-scanner-tool.html. Thank you.